I sometimes have many running applications and switching between them with Alt+Tab becomes very tedious. I would like to be able to switch between tasks/windows more quickly. The perfect solution for me would be an application that lets me start typing a window's title and offers a classic auto-complete drop down list to choose from. Does anybody know of a technique, tool, or lightweight application that offers something similar to this? There is a free application called Switcher that boasts many features, one of which is a keyword search integration amongst all open applications. You can read a review of the application on Technospot. Switcheroo is for anyone who spends more time using a keyboard than a mouse. Instead of alt-tabbing through a (long) list of open windows, Switcheroo allows you to quickly switch to any window by typing in just a few characters of its title. It's inspired by Emacs's IDO mode buffer switching. The lovely autohotkey scripting language! This takes a command line option of what window you want to switch to (case insensitive regex), so is perfect for somebody already using an application launcher such as Executor, Launchy, so on. Well I'm not really using it yet, but Enso let's you hold caps lock and type what you want to do - including "go windowname" and it auto-completes with dropdown. 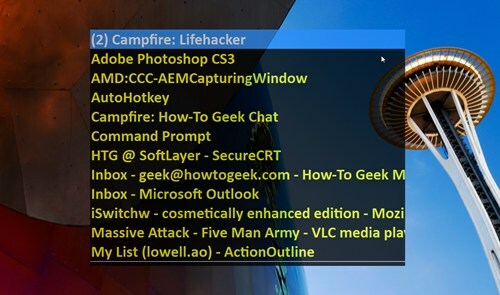 filters through a list of open windows as you type—with a semi-transparent dialog accessible by simply pressing the Caps Lock key. Windows Task Manager may actually be what you want. Invoke it (e.g., by Ctrl+Shift+Esc), go to the “Applications” tab (if you aren’t there already), select the task you want to go to (click or cursor down or type the first letter of its name), and press Enter or click on “Switch To” or double-click on the task name. Not the answer you're looking for? Browse other questions tagged windows-7 windows keyboard-shortcuts alt-tab or ask your own question. are there any applications/extensions to aid faster resizing and movement of windows in Vista/XP? How do I switch between applications in Windows 8? Windows of applications fail to come 'to front'. MS Word - Shortcut to cancel last autocorrect?